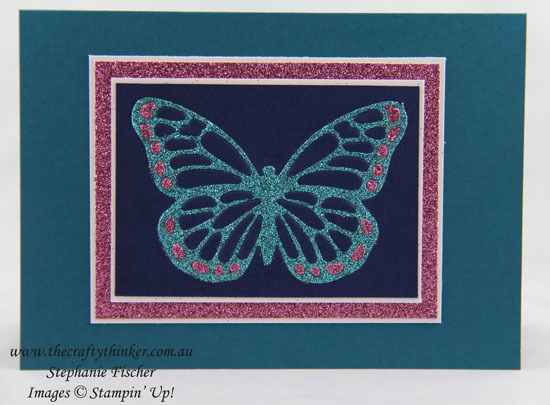 This card is entered into the Crazy Crafters' Project Highlights this week. Click here to see all the other great cards and vote for your favourites. The assortment pack of Glimmer Paper is so generous (and FREE during Sale-A-Bration!) that I've been trying to think up ways to use more of it! To inlay the butterfly, I cut it out three times - once from the Night of Navy panel, once in Island Indigo Glimmer Paper and finally in the Sweet Sugarplum Glimmer Paper. I layered the Night of Navy panel onto the Whisper White, glued the Island Indigo butterfly into position and then added the pieces of Sweet Sugarplum and Night of Navy. Easy but a little time-consuming! Tip: Try to keep the butterfly pieces in position after cutting, to make it quicker and easier to identify the pieces you need. 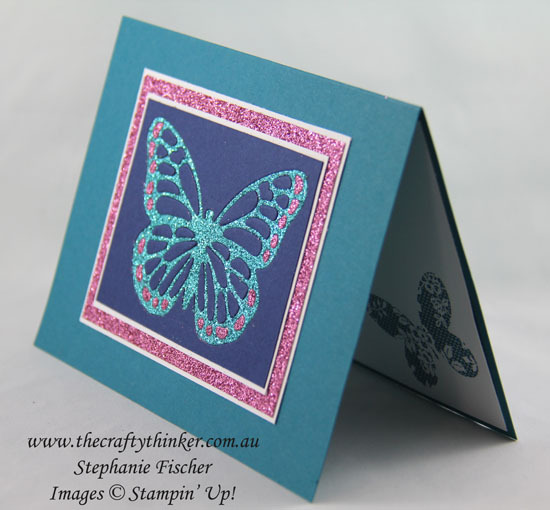 I kept the layout of the card simple to offset the over-the-top nature of all the glimmer paper! Sale-A-Bration is coming to an end, so be sure to take advantage of the amazing deals and special products before the end of this month.